It is common for genealogists to discover that at least some of their ancestors were immigrants to the United States of America. That knowledge points genealogists towards other countries that might have vital records about their ancestors. A map from 1940, that emphasizes that America is a nation of immigrants, is now getting passed around the internet. 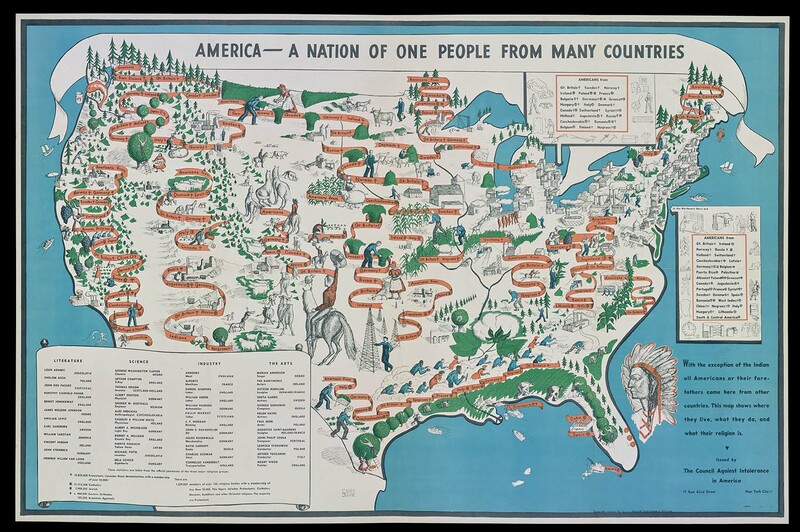 The map is from the Common Council for American Unity (CCAU) and it was produced in 1940. The Common Council for American Unity was an organization that was founded in 1939. Its purpose was to advocate against the prejudice and discrimination on the basis of ethnicity. The CCAU was founded by James Waterman Wise, with the mission of “combating prejudice by calling attention to American ideals, heroes, and traditions.” This mission was carried out by producing publications that promoted the ideals of tolerance and unity. The CCAU released information to the foreign language press, operated a radio service, and a publication called Common Ground. The CCAU worked with the United States government to help with activities like alien registration and foreign language publicity. The map from the Common Council for American Unity that has been featured in several recent articles is poster sized. 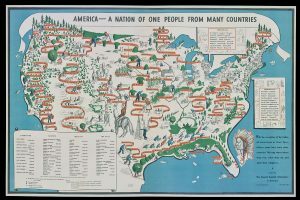 The map is titled “America – A Nation Of One People From Many Countries.” During the years that led up to World War II, isolationist sentiment was strong throughout the United States. At the time, some Americans felt that immigrants were a threat to the country. The map of the United States produced by CCAU erased the boundary lines between states. It includes red ribbons that gracefully flow across the country. Each ribbon represents the dispersal of ethnic groups across America. Genealogists can search the map for ribbons that match their heritage, and see where some of their ancestors may have lived in the years leading up to 1940. In addition, there is a scroll that lists the names of significant American figures and their country of origin. It is broken up into four categories: Literature, Science, Industry, and The Arts. John Steinbeck and Albert Einstein both had German heritage. Banker J.P. Morgan’s family came from England. So did artist Grant Wood’s family. Composer John Philip Sousa’s heritage is from Portugal. The list goes on. At the bottom of the scroll, it lists several of the religions that people in America follow, and the number of Americans that follow it.